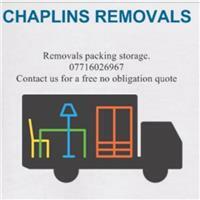 Chaplin's Removals - Removals/Storage based in Tiverton, Devon. Chaplin's Removals has been in business since 2009, we are a friendly family run business based in Tiverton, Devon, travelling all over the country. No move is too big or too small. Chaplin’s are always happy to help. We blanket wrap and strap all items and use protective coverings for all sofas, tv,s and mattresses for the safe transportation of your goods, we can also offer a packing service and the supply of double walled boxes and packing materials. Need a dismantling/reassembling service? That can also be arranged. Chaplin’s are here to make your move as easy and stress free as possible. We can also offer storage for those stressful times when your new home is not ready for you to move into. Here at Chaplin’s we encourage house visits to enable us to take an inventory and provide an accurate quote as every house move is different and we want to provide you with the service that suits your needs best. We provide a professional, friendly service whilst offering great value for money. Bridgwater, Brixham, Colyton, Cullompton, Devon, Exeter, Kingsbridge, Llangadog, Paignton, Somerset, Taunton, Tiverton, Torquay.